The ‘Parks Movement’ in Great Britain began during the 1830s and ‘40s as a result of the bad living conditions that had developed in the towns during the early years of the industrial revolution. Open areas were required for the relaxation and recreation of the industrial workers, and the general objective was to make these places as natural and picturesque as possible within their urban surroundings. Loudon, Paxton and Milner were three of the leading landscape designers of the day who were involved in park design, and they all adopted the ‘picturesque’ principles so greatly admired and advocated by James Pulham 2. In fact, it might even be fair to suggest that the introduction of parks at this time helped to provide him with the motivation to start producing his own range of terracotta garden ornaments in his Broxbourne manufactory in 1846. His fountains and vases were ideal for the more formal areas of municipal parks, and he may well have seen this as a potentially very lucrative market opportunity. Unfortunately, there is no definitive list of all the parks around the country in which his fountains, vases and balustrading can be found. The appendix to his promotional booklet only lists the landscaping projects on which his firm had worked up to the date of its publication c1877, and no mention is made of any terracotta installations. [i] Hardly any local authorities still hold records of the firms who actually supplied these items so long ago, and some of the officers now responsible for their care may not even have heard of the name of Pulham. James 2 did, however, build Pulhamite installations in some parks, and some of these also housed wares from his manufactory. Three of them are in Preston. Moor Park in Preston was actually the first municipal park in the country. It is Preston’s largest open space, with excellent recreational facilities, and plays host to many of the Town’s major outdoor exhibitions and events. It lies near the centre of the town, and used to be known, before its enclosure in 1833, as Preston Moor. 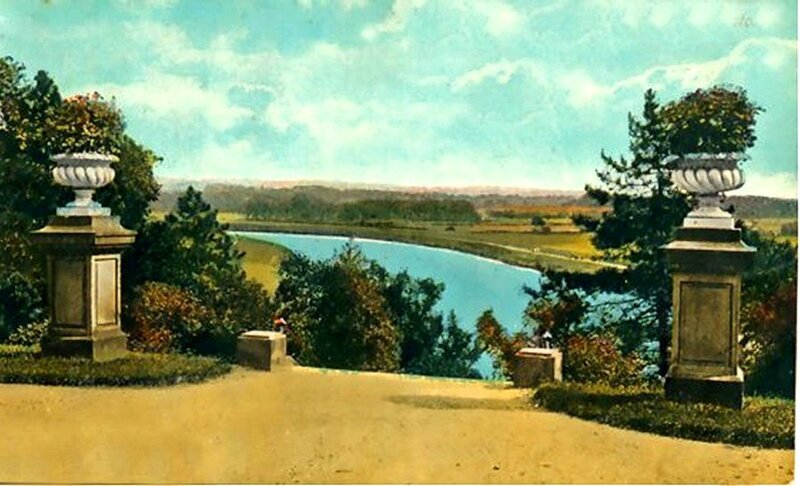 At that time, it contained nothing more than a lake and some walks, so the local Council commissioned Edward Milner to ‘complete’ its landscaping in 1864. This was done at a total cost of just over £10,800, and it is interesting to note that almost all of the general labouring work – such as the construction of the roads etc – was done by local labour. These were the men from the cotton mills made unemployed as a result of the cotton famine suffered by the Lancashire cotton industry during the American Civil War of 1862-65. James 2 confirms in his ‘Picturesque Ferneries’ booklet that his firm created ‘Rocks for bridges to rest on, Drinking fountain, Rocky Tunnel and roadway’ as part of Milner’s ‘completion’ process in Moor Park. This was done in 1865 – just at the time when James 2 expanded his firm by bringing in his son, James 3, to become James Pulham and Son – and Fig 1 shows two pictures of the Rocky Tunnel under the roadway – the one on the left being of a family outing taken c1900, and the one on the right was taken from roughly the same spot in 2002. Fig 2 shows one of the bridge abutments along the stream – ‘rocks for bridges to rest on’ – although this particular bridge has long since disappeared. The drinking fountain is a bit of a mystery – no such fountain exists today in that area, so maybe it was originally a terracotta ornament from the manufactory. 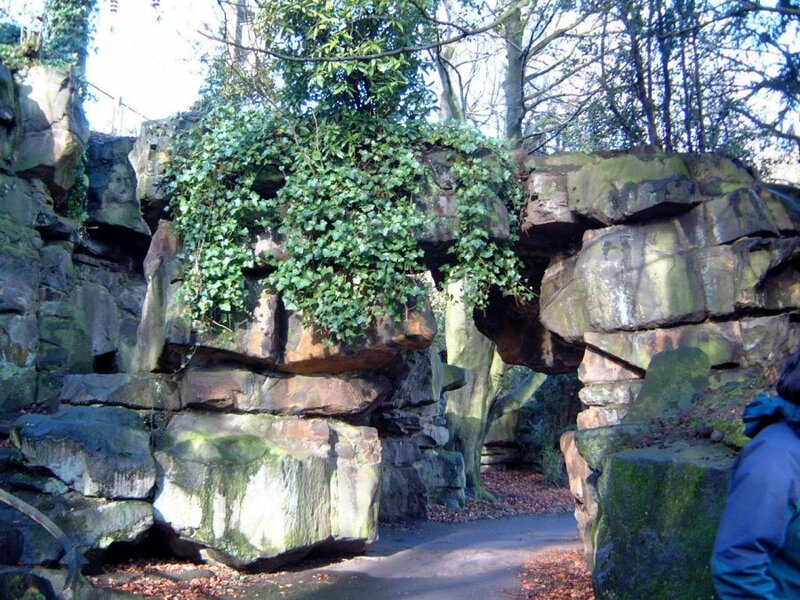 It is very encouraging to know that Preston City Council are currently in the process of preparing an Application for a Heritage Lottery Fund Grant of roughly £1.5 mil – out of an estimated total cost of £2.0 mil – to help them undertake a comprehensive restoration plan for the park that will include work on the Pulhamite installations, including the bridge. The increased supply of unemployed labour during the early 1860s also enabled the Preston council to press ahead with the creation of two more parks to the south side of the town, and these, too, opened in 1864. Avenham and Miller Parks are effectively ‘twins,’ since they are adjacent to each other, separated only by the viaduct of the then East Lancashire Railway. This obviously created a major boundary feature for both parks, and Milner actually turned this to advantage by using it as a backdrop for his planting of a variety of trees and shrubs. 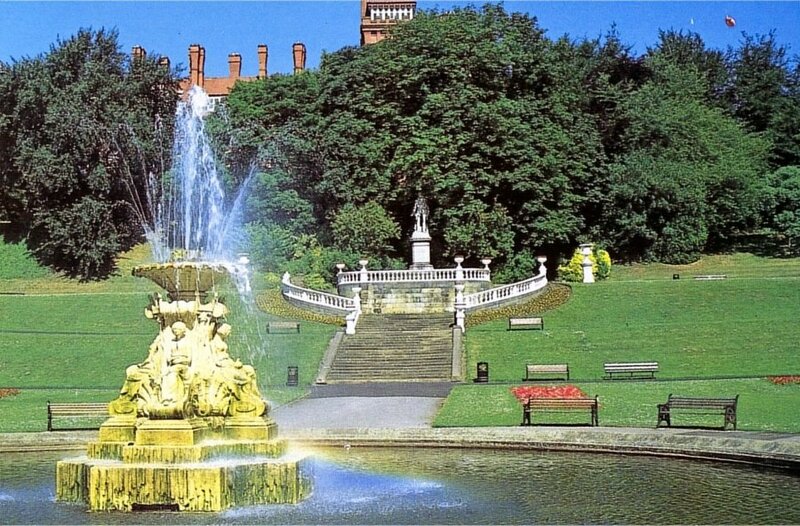 These parks are generally regarded as being among the finest examples of Victorian parkland in the north west of England, and probably the best surviving examples of Milner’s work today. 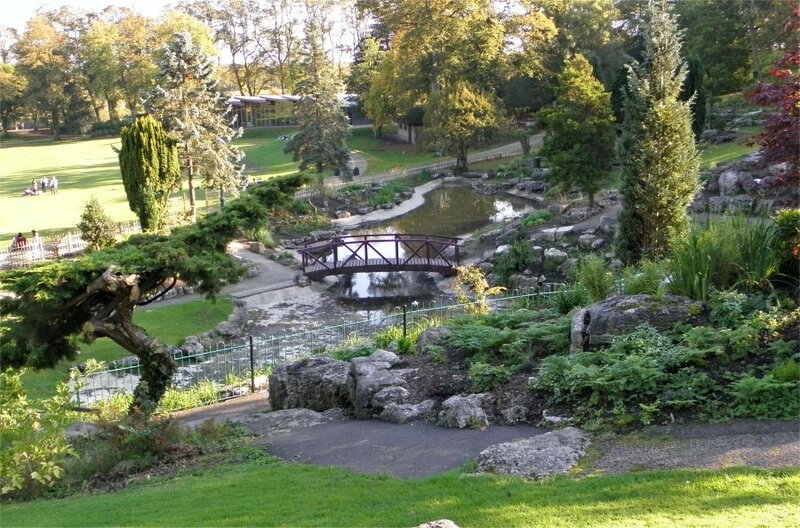 Avenham Park was created from a natural amphitheatre, where many large-scale musical and sporting events are staged throughout the year. Sadly, James 2’s descriptive comment in his booklet is very cryptic – he simply mentions a ‘Waterfall, cave etc’. These are located in the famous Japanese rock garden, which would also have been constructed during their second visit in 1874-75. The garden contains a wide variety of unusual ornamental plants, and is shown here in Fig 4. The bridge is obviously a modern replacement. No Play Stations and Children’s television in those days . . .
Miller Park is situated adjacent to, and on the western side of Avenham Park, and also borders the River Ribble. The land on which it was built was donated to the town by Alderman Thomas Miller, father of Thomas Horrocks Miller, whose family owned the world-famous cotton firm of Horrocks of Preston. 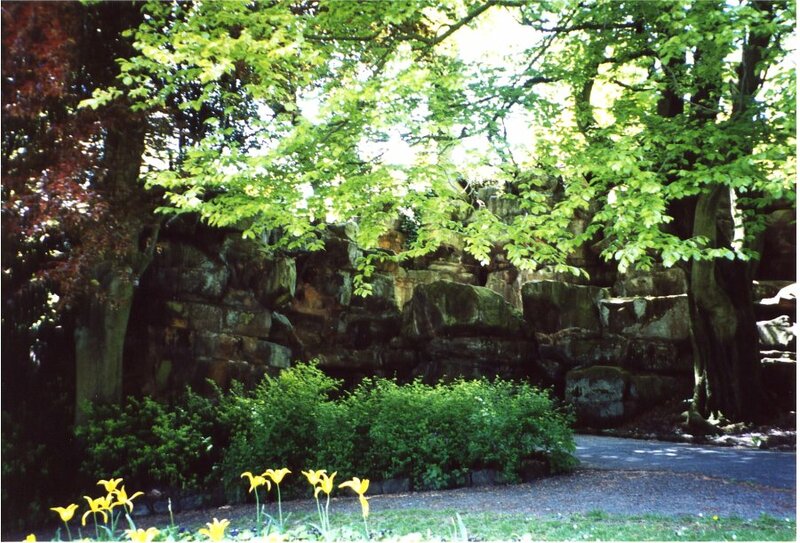 This park is reputed to boast the best floral displays to be found in Preston – together with some excellent Pulham rockwork and vases. 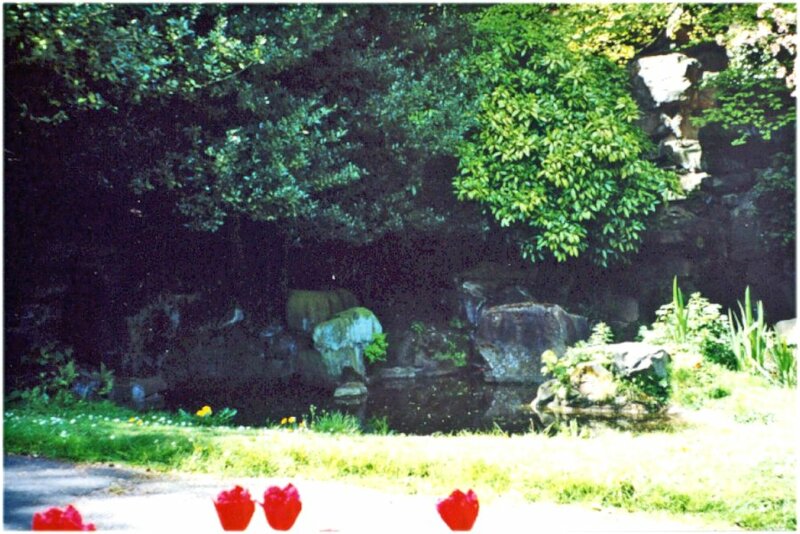 Having established the provenance of the vases, and knowing that Pulhams constructed the rock features in these parks, it seemed only logical to conclude that they probably also supplied the balustrading and the fountain in Miller Park, but this does not appear to have been the case. There is no mention of the balustrading in the Council Records, although a quotation for the building of the Terrace Walk, and for the erection of two sets of steps was accepted from a James Fitchie. Assuming that these are the main steps leading up to the Terrace in Fig 6, then he will presumably have also supplied the balustrading, although it is possible that he may have sub-contracted their manufacture to James Pulham. Unfortunately, this is something that cannot be substantiated one way or the other. 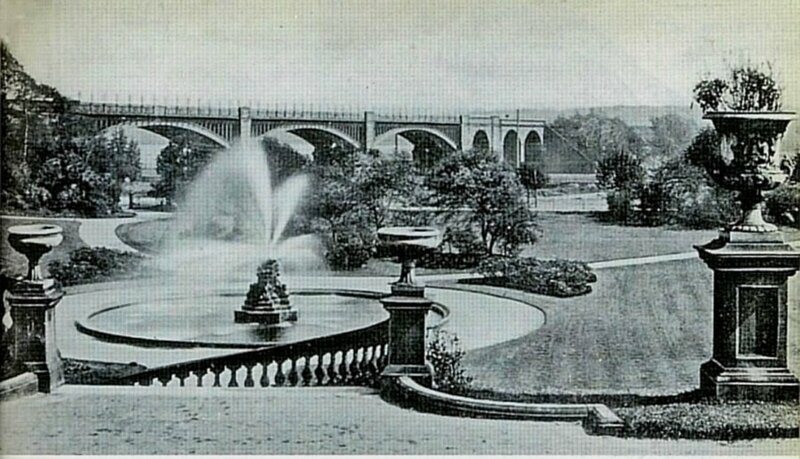 The magnificent Miller Park fountain is shown in the foreground of Fig 6, and I initially assumed that this could also be accredited to the Pulham Manufactory, but I was wrong, because the Records reveal that it was designed by Milner, and constructed by C R Smith in Longridge stone at a cost of £217 – 3s – 7d. The stonework around its base was artificially ‘weathered’ during production, and the figures around the base are emblematic of Earth, Air, Fire and Water. The angles are occupied by rush and trident designs, and a large, shell-like basin permits a most impressive display of jetted water. The leading Preston firm of Architects and Building Contractors, Cooper and Tullis, constructed the basin, and the jets were supplied by Easton Amis and Co. The publicity leaflets published by the City Council tell us that the fountain was restored to its original splendour during 1993, and they obviously made an excellent job of it, although it is difficult to understand why they decided to paint all the vases and balustrading white in the process. The large statue at the top of the steps in Fig 6 is of Edward Stanley, the 14th Earl of Derby. It was sculpted by M Noble, of London, at a cost of £2,500, of which more than £340 was raised by one-penny contributions from local workers. 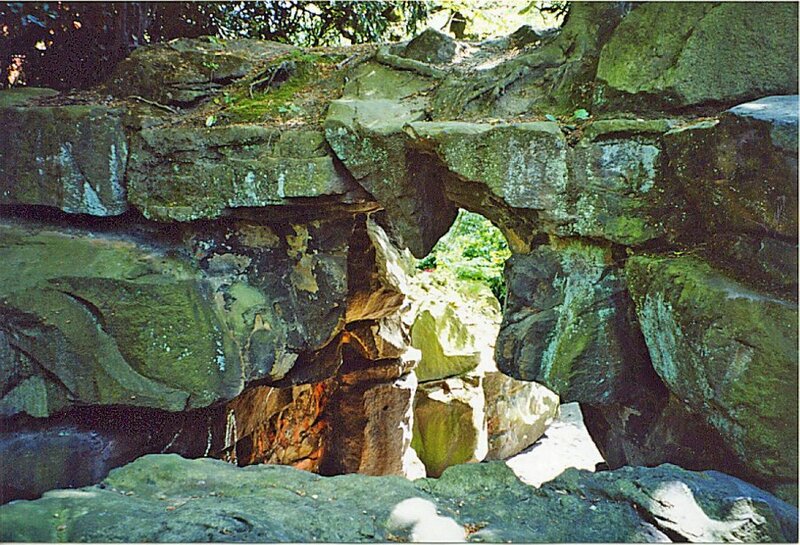 A pathway runs west to east below the embankment – Fig 8 – and then splits in two to circumvent the rock feature – the right-hand path goes around its base, and the left-hand path goes over the top of an archway, similar to the one in Moor Park. This is shown in Fig 9, whilst Figs 10 and 11 are taken from the top. The two paths are called the Lower and Upper Paths, and they join up again on the other side of the archway. 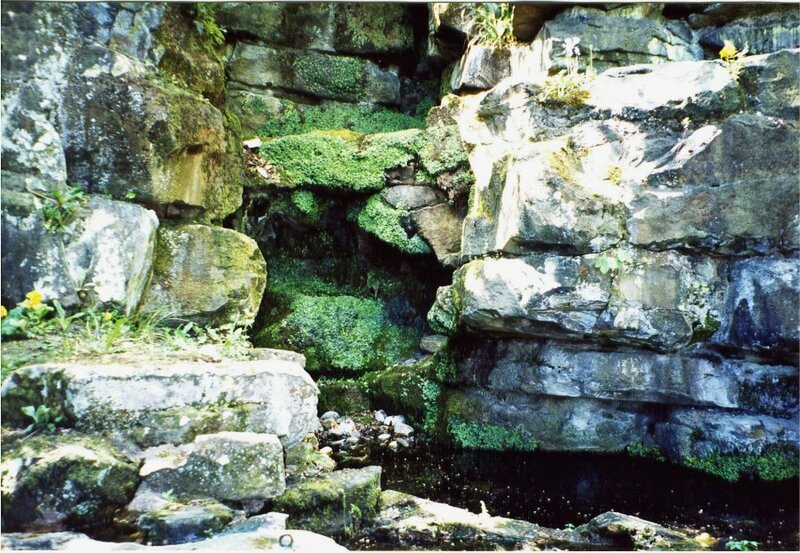 There is a small, rocky pool between the upper path and the embankment, and the water is channelled under this path to the waterfall to fall over the ‘cliffs’ to the pool by the lower path. The water currently only flows during the wet weather, and it is not known whether or not there used to be a pump to circulate it on a more permanent basis in the early days. Figs 12 and 13 show the small pool between the embankment and the Upper Path, and the gap in the Archway can be seen in the right background. 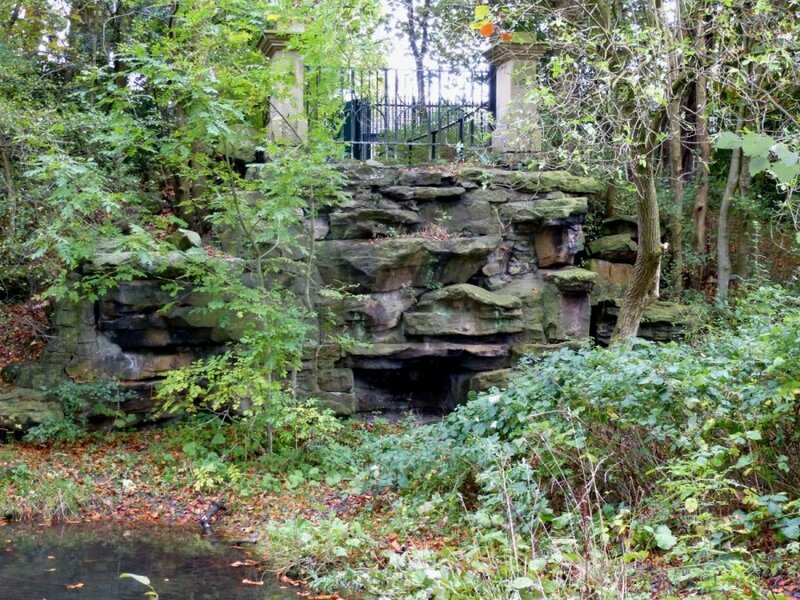 Finally, James 2’s notes also refer to a ‘naturalistic drinking fountain’, and this is shown in Fig 14 alongside the picture of a plaque that appears to designate the Pulhamite rock feature as the ‘Miller and Avenham Park Orienteering Course’ – probably not quite the sort of thing that James 2 had in mind when he constructed it . 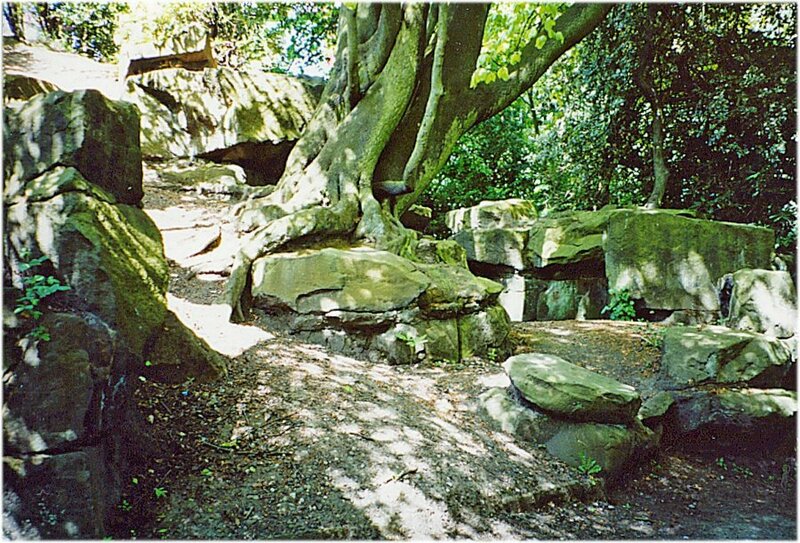 . .
A major restoration project was undertaken in Avenham and Miller Parks in 2008, although that did not include any work on the Pulham features. However, plans are afoot for another scheme costing c£8.0 mil to be undertaken soon, subject to the granting of an Appplication for another Heritage Lottery Grant. This can only be good news, and has to be celebrated, thanks to the efforts of the Council’s Planning and Design Dept. [i] ‘Picturesque Ferneries and Rock Garden Scenery’ by James Pulham 2, published c1877. [ii] Chronological Review of the Avenham and Miller Park developments compiled by the Preston Park Rangers – (Thanks to Sharon Saunders for providing this information). [iv] Garden Ornament Catalogue, the Catalogue published by James Pulham and Son c1925. Posted on December 1, 2013 May 2, 2017 by Claude HitchingPosted in Sites Month 2Tagged . . James Pulham and Son, Avenham Park, edward milner, fountain, Miller Park, Moor Park, Paris Vase, Preston, Preston Vase, Pulham archway, Westonbirt Vase.